It is an adventure to stand with one foot in the northern hemisphere and one foot on the southern hemisphere of the world while in Uganda for a safari. Experience this by visiting the Uganda Equator for a safari tour. As said by Wikipedia, “The equator (sometimes referred to colloquially as “the Line”) is the intersection of the Earth’s surface with the plane perpendicular to the Earth’s axis of rotation and containing the Earth’s midpoint of mass.” This in short is the imaginary line that splits the earth in half. The north on one side and the south on another. While you’re at the Uganda Equator during a safari, you will see this by a line drawn in the middle of the boulevard. 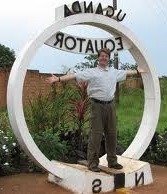 With a monument on either sides that state “Uganda Equator”. It is indeed an amazing feeling to stand on both sides of the world while on a Uganda Tour. Other than the fact that you can stand on both sides of the Equator on a safari to Uganda, there is also a mind blowing experimentation of how water drains straight down at the Equator. But the water will channel clockwise on the northern hemisphere and counter clockwise on the southern hemisphere. This is something extraordinary to see while on a Uganda tour.